One of the absolute highlights of a trip to Morocco is seeing the vast Saharan sand dunes and camping under the stars. In Morocco, you have the choice between two broad areas where you can visit proper dunes; the Erg Chebbi dunes near to Merzouga and the Erg Chegaga dunes close to M'hamid. Both sets of dunes offer a fantastic experience and both involve betweeen 8 - 10 hours in the car. Choosing which dunes to visit depends on your other plans in Morocco and where else you intend to visit. Whichever one you choose, there is nothing quite like watching the sunset in the peace of the desert. 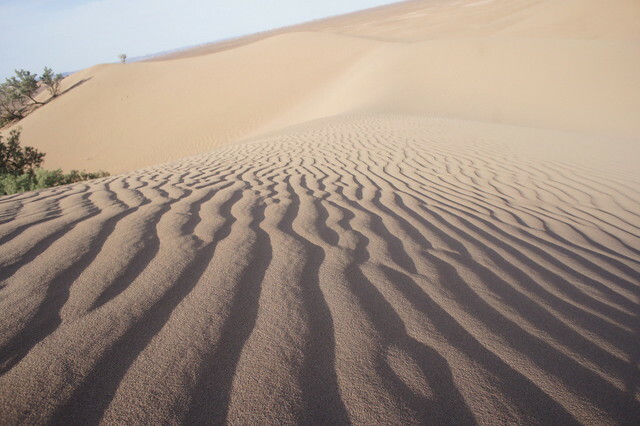 The better known of the two sets of dunes, Erg Chebbi is the more established and as a consequence is more developed. It's ease of access is a bonus - the drive to Merzouga is long - apporximately 10 hours, but there are places of interest to visit along the way, such as Ait Ben Haddou, Dades Valley, the Valley of the roses and Todra Gorge. The excursion out to Erg Chebbi is possible in 3 days / 2 nights, but we strongly advise that you take your time over at least 4 days / 3 nights and enjoy the sites along the way. 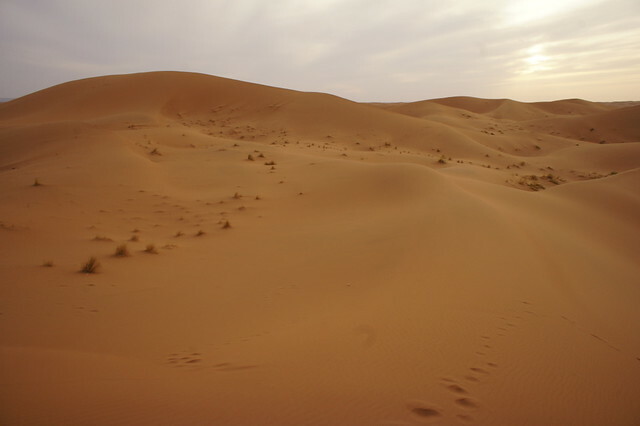 Once you reach Merzouga, it is a 2 hour camel trek out to a camp in the dunes. Camps vary in size and location but be warned that they don't tend to be particularly isolated, so you may well hear the beat of another camp's drums drifting across the dunes. This doesn't necessarialy ruin the experience, but it does take away from the wilderness feel. The real bonus of Erg Chebbi is that it can be nicely fitted into an itinerary involing Marrakech & Fes as it sits about half way between the two. Erg Chegaga is a much younger destination, as owing to border disputes with Algeria, tourists have only been visitng since the 1990's. That said, it is becoming more popular and there are more camps than there used to be. As far as solitude is concerned, however, it still has the upper hand over Erg Chebbi. The journey from Marrakech is about 9 hours, but the last two have to be by 4X4 as the road is not sealed once you pass the gate way town of M'hamid. The journey down to Erg Chegaga is fascinating, You can add a visit to Ait Ben Haddou along the way and then follow the Draa Valley and the many oases & crumbling Kasbahs dotted along the way. Once you reach the small town of Mhamid, you can continue on to one of the camps on the dunes, or you can trek by camel direct from there. The dunes themselves are not as big as out at Erg Chegaga, but the desert is somehow more vast and wild here. Erg Chegag offers the chance for some true wild camping and saves you a couple of hours in the car. It is perfectly possible to manage a visit to Erg Chegaga in 3 days, but we recommend visting the dunes and then spending time in one of the palm groves and at Ait Ben Haddou as well.